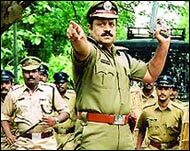 I first had the opportunity to interview Suresh Gopi in 1997, when he was a superstar in Malayalam but ready to relinquish everything. I interviewed him again in 1998, when he won the National Award for his performance in Kaliayattam. I also met him when he donned a new role, that of a social worker. Now, he has returned to the silver screen as a character he portrayed 11 years ago -- Bharat Chandran IPS. And what a comeback it has been! He went away as a superstar and came back as one, as if the people of Kerala kept his seat vacant for him to come and reclaim it. On the eve of the film celebrating 100 days, a very relaxed and extremely happy Gopi spoke to rediff.com. Excerpts from a conversation. What was in your mind when it was suggested that you once again portray Bharat Chandran? Did you believe that like the most famous line of the film, Ormayundo ee mukham (Do you remember this face? ), people remembered Chandran? I wanted to see if people still remembered my face! (laughs) Certain things happen in your life to sustain you for a lifetime. I am sure Bharat Chandran, Chakochi and a couple of other characters that came to me early in my career will help me once again. I still remember you speaking about your decision to quit acting because many parents accused you of polluting young minds. Don't you feel you were hyper sensitive about the whole episode and acted hastily? Yes, now I call them silly reasons to quit acting, or wrong decisions. Yes, it was also a hyper sensitive decision that came fast. I was hurt, and still am hurt because, even after I kept out of such roles, has the industry become cleaner? Now I know I can't do the cleaning process alone. There are so many other bad activities in the industry, but no one wants to pose questions. Fingers were pointed only at me. Don't you feel you took all the criticism quite personally? I know I did. It was unnecessary, too. When parents accused me of polluting young minds, I was hurt. Now I know my profession and my social responsibilities are two different things. They have to be viewed from different perspectives, and different angles. Were you thinking about this over these four years? Although I don't ponder over the past, there was this feeling in my mind, of late, that I took a wrong decision in my career. I also learnt that people have started forgetting me. They even failed to recognize me. It gave me the realisation that an actor had to be in the limelight till his death. Though I was never a good organiser of my projects, this time I thought I should do something. I also wanted to make the lives of my family brighter. I called up Renji Paniker, who wrote all my super hit films, and told him about my vision of politics. I have a very clear, genuine vision about what political work should be, what politics and politicians should contribute to the nation. I asked him to think about a character who feels for the masses. He said he would get back to me in two weeks. He called, saying he would bring me back as a police officer, not a politician. We began shooting in May 2005. When you put on the uniform and became Bharat Chandran IPS after 11 years, was it like starting everything afresh? I became younger by 11 years! (laughs) I was the police officer of Malayalam cinema, and I have the full kit in my wardrobe. Something else -- the 100th-day poster of Bharat Chandran IPS will have the caption, 'Ambassador of Indian Police!' Even I feel I am an ambassador for the Indian police. Even if someone doesn't want to give me that credit, I want to have it for myself (laughs). While shooting, did you think about the fate of the film at any point? I was never bothered about the fate of the film. In fact, I had to forget about it. I was prepared to take it, bitter or sweet! The film was going to either give you a rebirth or kill you. Were you nervous? Two days before the release, I lost control over myself. I am very religious, but I became even more so. I was running from one temple to another. I was just drifting from moment to moment. It was terrible. I thought I would go mad. The day before the release, my entire family, my brothers included, gathered in Kochi with me, and that was helpful. On the day of its release, I sat in front of an image of Lord Guruvayoorappan, and started meditating. I sat there for 55 minutes. The call I got after that was that the film had a super opening but, by then, I was too exhausted to stand. I had to be taken to hospital. Then, there was a flood of phone calls. I didn't get as many calls even when I won the national award. The same people who criticized you, and the generation that came after, have accepted you wholeheartedly. Has the hurt gone? Because I was a stupid fool, I reacted emotionally. I realised my stupidity late. Did you expect a welcome of this magnitude to your comeback? You cannot expect these things. You don't have the right to expect anything, but I used to dream. Whose idea was it to have posters with the caption, Ormayundo ee mukham (Remember this face)? It was Renji's. I think it was emotional for the audience. (Laughs) Even if they didn't recognise me, I can't blame them because I had changed completely. I had put on a lot of weight. What helped me was, in these 11 years, the film Commissioner was on TV repeatedly. Every time it came on, which was at least 3 or 4 times a year, a new generation saw it. I think people didn't get the feeling I was out of the industry. Those who were just 9 then are 20 now. Those who were 15 then are 26 now. Those who were 20 or 25 then are 35 and 40 now! You feel old only when you look at the statistics. Otherwise, I am 11 years younger!